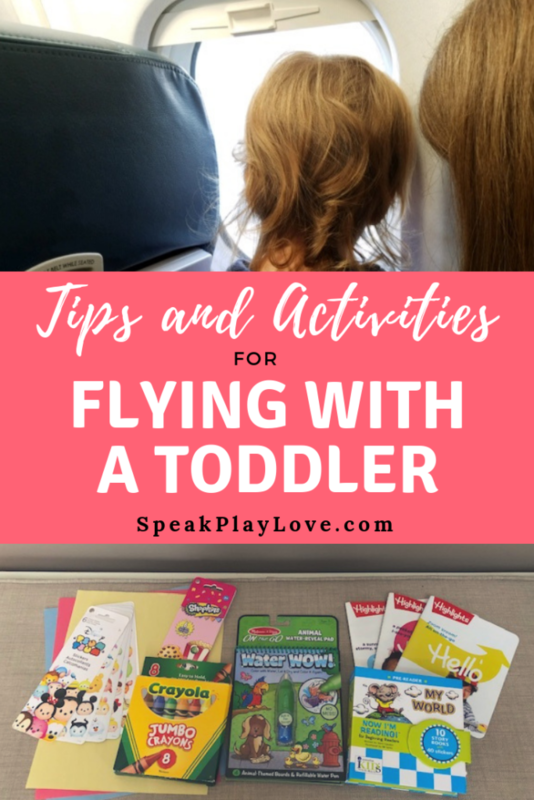 Activities and Tips for Flying with a Toddler | Speak. Play. Love. This post may contain affiliate links, which means we could receive a commission if you click a link and purchase something that we have recommended. Sylvie was *almost* 2 years old during this last Christmas flight (22 months). So far we’ve braved five flights with her as an “infant in lap” (i.e. “free”). 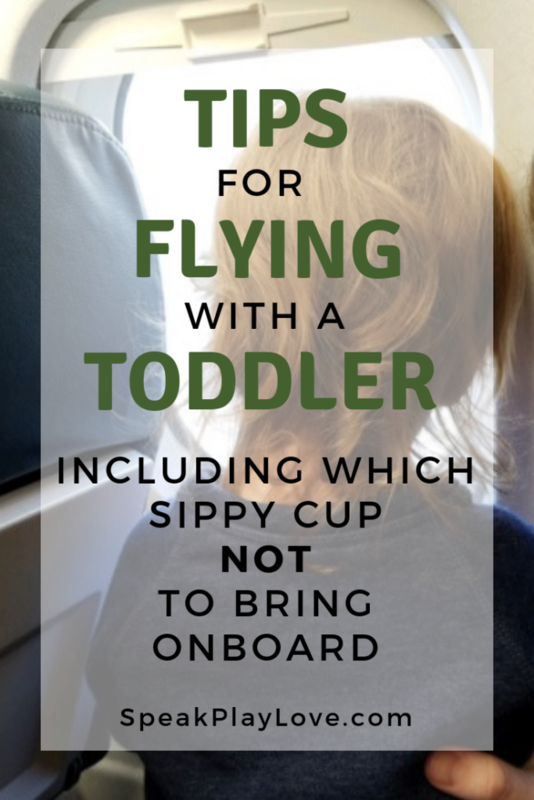 While I’m no expert, I do have some helpful tips for flying with a toddler based on our experiences! This trip went relatively smoothly! Though I have to warn you that in two previous trips I’ve ended up covered in baby vomit, so the bar is set pretty low – see tip #2: pack extra clothes for yourself in your carry-on. 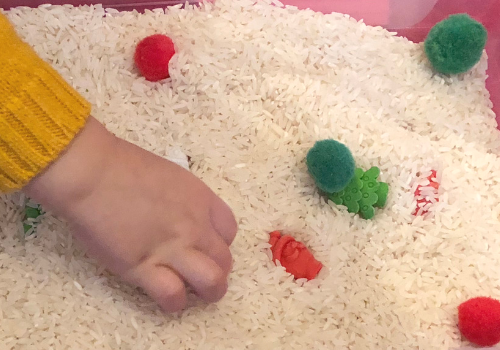 Now that Sylvie is at the toddler stage, it’s a little easier because she is interested in more things. (Keep reading for the toys and activities we used to keep her occupied.) On the other hand, as a toddler if she had decided to really throw-down – it could have been a scene! Think about the timing of the flight(s). We chose super early flights (take off of first flight = 6 a.m.) because Sylvie is a notoriously bad napper and I didn’t think that she’d be able to nap on the plane. (When she was a baby – she napped a lot on the plane though!) If I had found a flight at 8 a.m. that would have been ideal, but sometimes you are at the mercy of the airline’s schedule. On the other hand, if your tot sleeps in the car, then maybe he’ll sleep on the plane too. . . If you are going to use screen time, invest in child-safe, volume-limiting earphones. After a little research, I chose BuddyPhones for Sylvie. 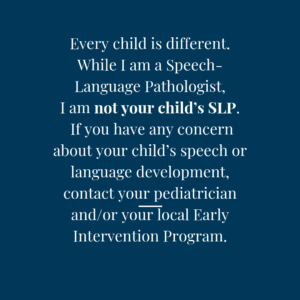 Our children’s hearing is precious – we’ve got to protect those little eardrums from damage. Plus, your child can keep using her volume-limiting earphones into elementary school! Click here to see BuddyPhones on Amazon. I’m normally not a proponent of extended screen time, but I think the airplane is worth an exception! Goal = get to the other side with everyone’s sanity intact including the passengers around you. Bring an empty sippy cup with you, but not a CamelBak. I love Sylvie’s kid’s CamelBak. She uses it everyday, but something about the pressure changes that occur during flight force water out of the spout (a lot of water). Luckily it was stowed in an outside pocket of her diaper bag and the contents of the bag was safe – could have been worse! 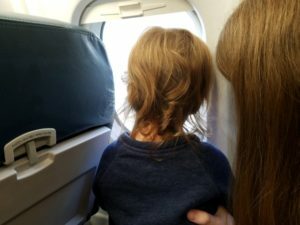 On the return trip, we packed her CamelBak in checked luggage and brought a Munchkin Miracle 360 cup on the carry-on – No leaks! Pack extra clothes for your toddler/baby and for yourself. You never know when a diaper blow-out or motion sickness will happen. I learned the hard way that spending your entire layover trying to find souvenir sweatpants to change into (unsuccessfully) is not fun 🙁 Thank goodness we were not seated in a row with any strangers on that trip! I also read recommendations for lollipops – they take a long time to eat. It’s on my list to try next time! Watching Movies/Shows: Since we already use Netflix at home, we just used the Netflix app on my phone. Only some shows/movies are available for download (rather than streaming), so a little pre-trip prep is involved. Get the app on your phone and download some shows before you leave, otherwise you’ll have to pay for wi-fi on the plane to view shows. Reading: Luckily, Sylvie is a huge fan of books. One problem is that books are bulky and heavy. 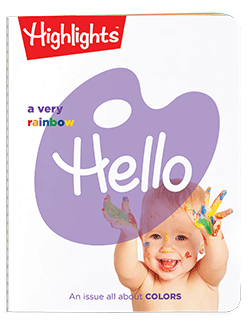 I love the Highlights Magazine for babies called “Hello!” The little magazines are the perfect size for your diaper bag and the pages are made out of a tear-resistant, thin plastic. Click here to order Highlight’s Hello Magazine for your tot! I picked this up at a local store near us on a whim and kept it hidden away until the trip. I was pretty sure she would like it, but I had no idea how much! Throughout the whole trip, she wanted to “do painting” 5+ times per day and she still wasn’t tired of it on our return plane trip! You fill up the paintbrush/pen with water and then as your little one paints, it turns the white parts of the pages into colorful pictures. 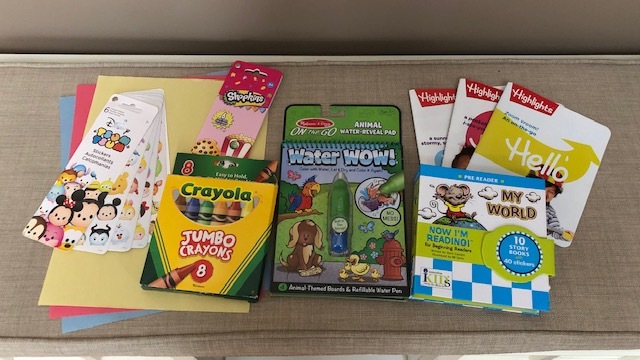 You can also help your child find the hidden items listed on each page. The cardboard pages dry within about 10 minutes, fading back to the original white backgrounds. 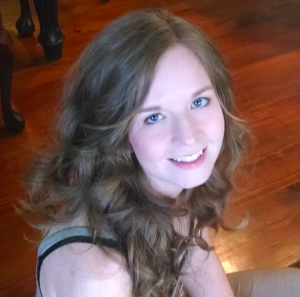 I can’t claim this idea – I read it on the Barefoot Blonde website. If you can snag a window seat, these alphabet window gel clings are perfect for playing with on the window and practicing some early literacy skills. 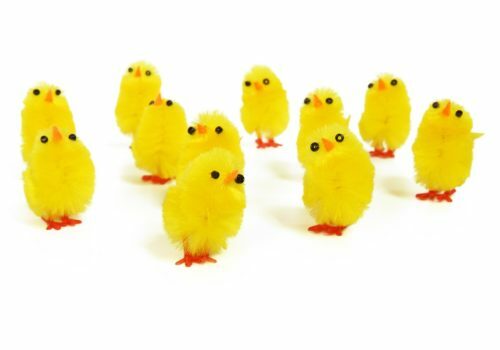 You can find them here from Amazon. Those are my tips! I hope you find them helpful. 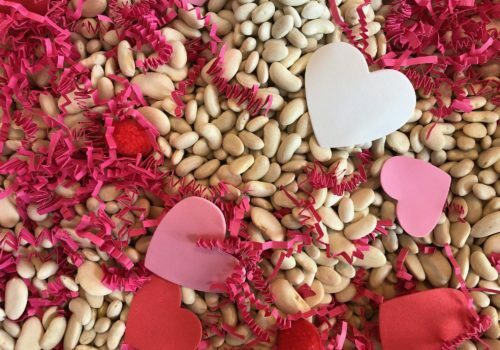 If you have any go-to tips or activities, please share them with other readers by leaving them in the comments. I love to hear from readers!